I am delighted to have teamed up with Sprouts to bring you this magical collaborative event. Once upon a time there was a little snowman who accidentally swallowed a firefly…. Shhhh! I mustn’t say too much! 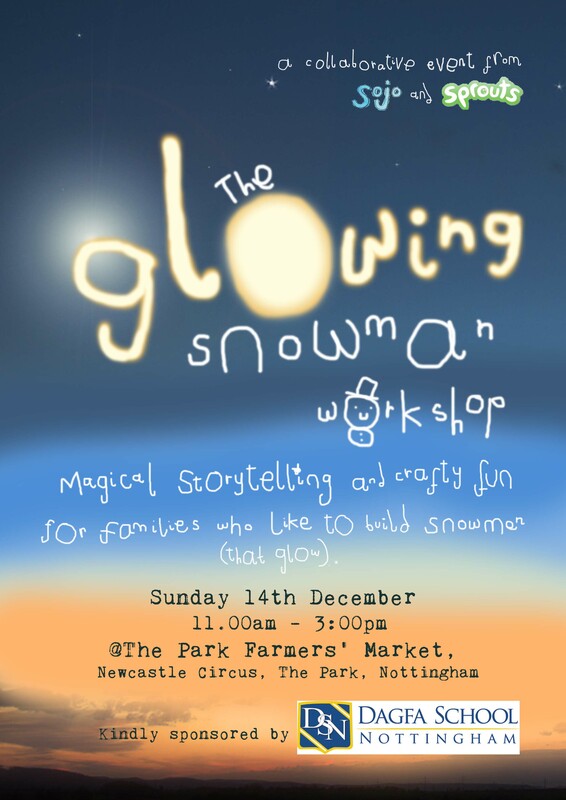 Should you decide to pop along, you will hear the whole of this whimsical tale through some delightful story telling and interactive fun, Sprouts style! Families will be presented with a lovely willowy bundle, with all the bits and bobs needed to build a brilliant snowman. Each snowman is unique in appearance and personality. We want to learn about your snowman’s character and your children will be invited to chalk out their ideas on the special ‘Sojo Thinking Station’ if they’d like to. I would like to say a HUGE thank you to Dagfa School Nottingham who are kindly sponsoring the event. You can book a place for your family here. This entry was posted in Uncategorized by sojoanimation. Bookmark the permalink.